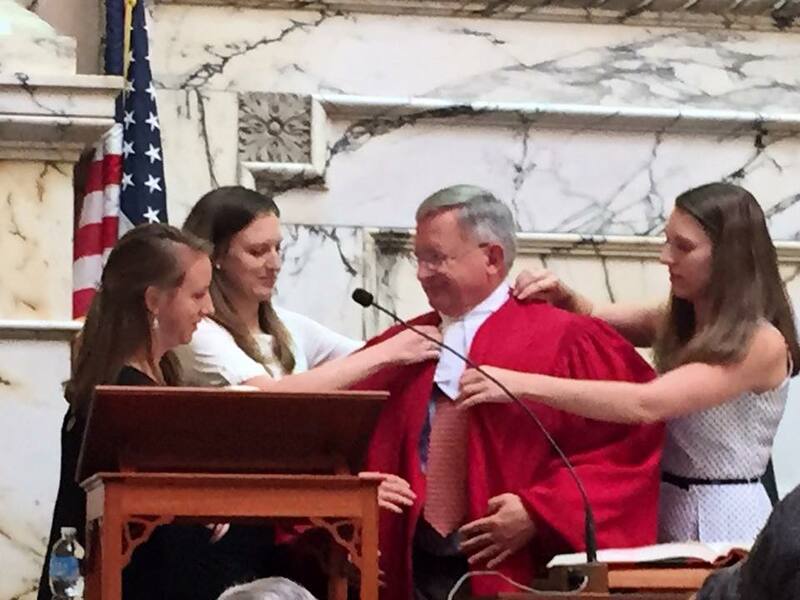 Joe Getty’s three daughters help him put on his new judicial robes at the rostrum of the House of Delegates chamber. Gov. Larry Hogan swore in his chief legislative officer, Joe Getty, to the Court of Appeals at the State House Monday, with a big heaping of bipartisan praise. Getty brings an unusual range of experience to Maryland’s highest court, having served as a Republican delegate and senator from Carroll County and chief legislative officer to both Hogan and Gov. Bob Ehrlich, in addition to his private law practice. 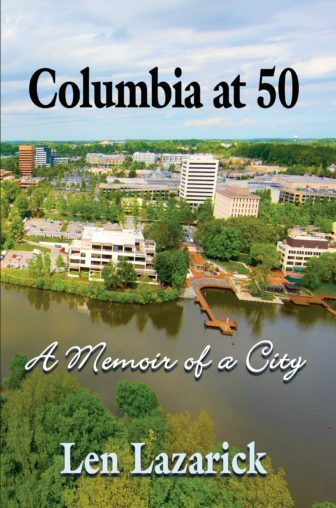 He offers “an invaluable and unique perspective,” said Hogan. One of the most lasting legacies of any Maryland governor is his appointment of all state judges from district to circuit to appellate courts, since their terms are all longer than a governor’s. But with Getty, 64, Hogan’s legacy won’t even last to the end of a possible second term, since all Maryland judges must retire at age 70, as Judge Lynne Battaglia did unwillingly, the Court of Appeals jurist Getty is replacing. Hogan said he got a lot of letters urging Getty’s appointment, but “one letter stood out,” the governor said, coming from Joe Bryce, Getty’s predecessor as chief legislative officer for the two previous Democratic governors, Martin O’Malley and Parris Glendening. “Joe Getty represents all that is good in a public servant,” said Hogan, quoting Bryce’s letter. Getty was also praised by both Democratic presiding officers of the Maryland General Assembly. House Speaker Michael Busch noted Getty’s “honesty and integrity,” congratulating Hogan on the appointment. Senate President Mike Miller bemoaned the loss of Getty’s presence in the Senate as a representative of the middle ground on issues. “When we lose people of [Getty’s] caliber, it really diminishes government,” Miller said. With his skill at three-dimensional legislative chess, Getty could “call every move,” Brinkley said. He recalled several legislative tactics by Getty that stymied, at least temporarily, legislation backed by Miller’s Democratic majority. When Getty took the podium wearing the new bright red robe that only Maryland’s high court wears, he went through a short list of Court of Appeals judges that had served either as legislators or chief legislative officers. And Thurgood Marshall, the civil rights champion, who saw the process of law and democracy as one of change and adaptation to the times. Chief Judge Robert Bell’s first experience with the court system didn’t come during his studies at Harvard Law School nor when he opened his legal practice in 1969. Bell was introduced to the court system the hard way. In his junior year at Dunbar High School, in 1960 the 17-year-old bell was arrested for involvement in a sit-in demonstration at a restaurant in downtown Baltimore.